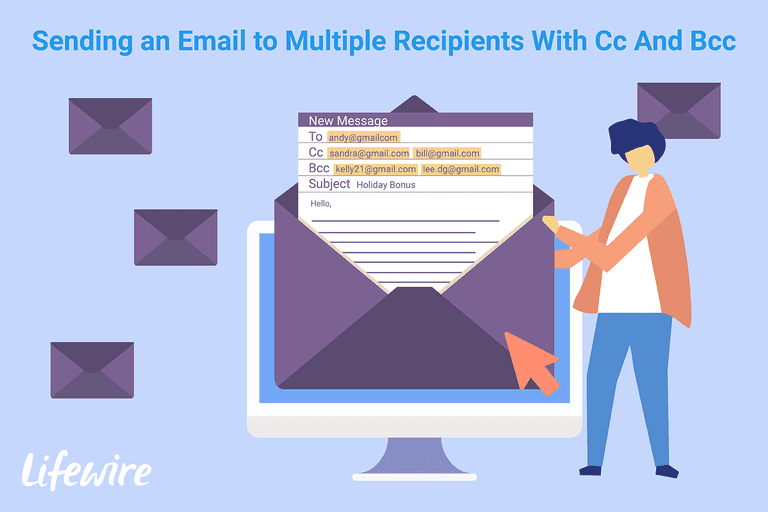 To blind carbon copy someone is to email them in a way where they can't see the other BCC recipients. In other words, it's used to email hidden contacts. Although this procedure covers the use of Gmail on the web, most email programs handle BCC just fine. In fact, RFC 2822 — an official standard — specifies how BCC should be implemented regardless of the program or service. Select Compose to start a new email. Select the Bcc link to the far right of the To text area — but you won't see it until you place the cursor in the Recipients line. You should now see both the To and Bcc field. Another way to toggle this field is to enter Ctrl+Shift+B on Windows or Command+Shift+B on a Mac. Enter the primary recipient in the To section. You can even write more than one address here just like you can when sending regular mail. Just remember, however, that addresses here are shown to every recipient, even every Bcc recipient. You can also hide the addresses of all recipients by leaving the field blank or entering your own address. Use the Bcc field to enter all the email addresses you want to hide but still get the message. Edit your message as you see fit and then select Send. Blind-copy tools are useful for two major reasons. First, BCC as an administrative tool prevents "reply-all" snarls when someone replies to the entire list, which spirals into additional replies, potentially leading to hundreds or thousands of utterly unnecessary emails. By using BCC rather than CC for major announcements, you'll foreclose this problem. Second, BCC keeps people's information private. Because the names and addresses of individual BCC recipients remain obscured to all but the sender, the privacy of the people receiving the message is assured. However, BCC isn't without its downside. People in corporate settings sometimes wield BCC like a knife, using this field to surreptitiously loop in supervisors or coworkers in a manner unknown to the public recipients of the message. A good rule of thumb is to not use BCC unless you'd be okay with the BCC list accidentally leaking.